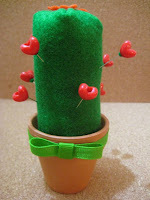 Sometimes Love Hurts as shown in this delightful cactus pin cushion (pictured) designed by Sheasy. The heart-felt sachets are also adorable. Tell your loved one you're My Kind of Valentine with these great cards by Elfrida. The beautiful red birds have a great Valentine feel, as well. I have always been fascinated with stained glass. What Valentine wouldn't be delighted to receive one of the stained glass hearts created by Dias y Flores? Bojangled Jewels has tons of terrific items, including My Heart is Ticking. 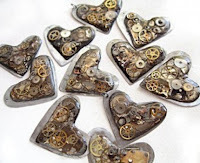 (pictured) This necklace features tons of tiny antique watch gears atop layered silver hearts. So unique! The locked & tied key and bow necklace is another fav of mine. If you'd like to create something special for you Valentine, check out the mini album kits & paper goods available at Scraps of Time. The Choose Me kit is full of delightful goodies perfect for celebrating your love. And don't miss the adorable add-on kits. I never really liked the taste of those chalky candy hearts I always seem to receive around Valentine's Day. But the candy heart jewelry by DC Designs seem a lot more appealing. I especially love the lime green Cutie pie necklace. The Pool of Love is another design that really caught my eye. totally LoVE your blog! 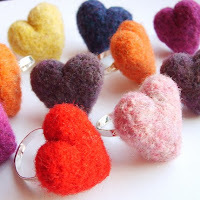 what an honor that you featured my felted hearts collection - thank you! I love art!!! These are amazing finds! The cards are very pretty too >> so Jessica!! Thank you Jessyca for talking about our hearts! Have a nice Valentine's Day!!! Those heart rings are totally cute! What a sweetHEART you are...Thank you for the write up and the wonderful words of encouragment. I enjoyed talking to you and your hubby on Saturday and so thankful that you made it there safely! 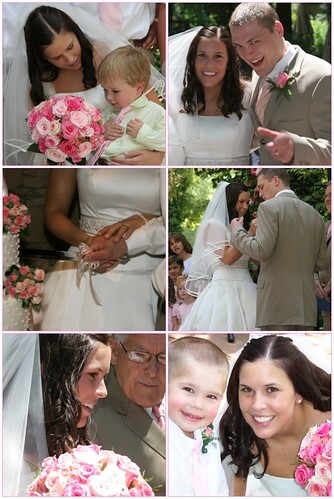 Love your blog and so does my daughter...I think she's addicted to your site.